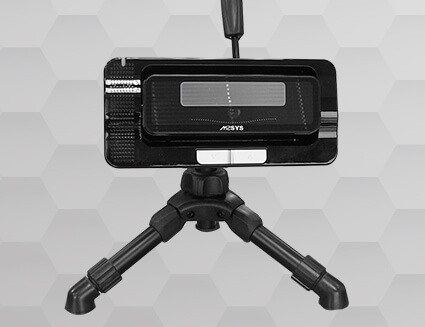 The M2-AutoTilt™ iris recognition camera is an affordable, compact device that delivers high quality images and can be instantly implemented through the M2SYS Hybrid Biometric Platform™. This compact, contactless, and hygienic iris scanner is ideally suited for large scale enrollment and authentication applications. The M2-AutoTilt™ iris scanner offers end users a wall mounted or free standing USB tethered configuration for quick and easy high quality image captures, helping to minimize Failure to Enroll (FTE) and Failure to Authenticate (FTA) rates through its automatic panning adjustment and LED three color light indicators that gently guides end users to ideal positioning to capture their iris image. This compact and affordable iris scanner offers many unique features such as real time iris distance, center, and diameter coordinate measurements. Built for high throughput environments where speed, accuracy, and user-friendliness are key hardware characteristics, the M2-AutoTilt™ contactless digital iris scanner helps to ensure high quality images for superior biometric matching templates while maintaining a hygienic environment.